Attach a 6-foot lead or cord to a scent-infused training dummy or the wing of a bird. (Freeze wings during hunting season and thaw them out when ready for training.) Use this to create “drags” of scent the dog will follow. Start with 10-yard straight-line retrieves on short grass. Gradually increase the challenge: curved drag lines, taller grasses, abrupt turns, short gaps in the scent trail by lifting the dummy off the ground for a foot or two. To stay on track, some dogs need reinforcement in the form of small bits of dog treats dropped along the trail. Use treats if you need to keep your dog excited, but sparingly. The point is to find the big payoff at the end of the trail, not the little goodies along the way. 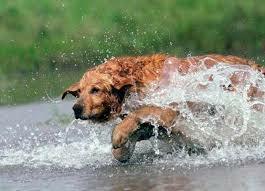 Once your dog is trailing enthusiastically, dial up the difficulty. Run the scent trail over a log, make a sharp turn, and drag it along the log as if the wounded bird ran down the log. 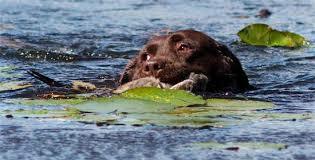 Run the scent trail in and out of the water along a creek or pond edge. Run it across a creek and continuing on the other side. Create longer and longer gaps. To really hone a dog’s tracking skills, make a dragging pole. 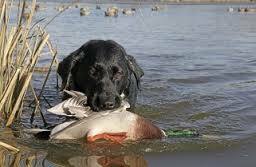 This is a particularly good drill for dogs that will hunt in the heavy cover of beaver ponds and thick timber. Cut a piece of PVC pipe about 5 feet long. (The diameter doesn’t matter—use whatever is cluttering up your basement.) Run a 10-foot section of parachute cord or other cordage through the pipe, and tie a slip loop to one end. Attach the loop to a bird wing or training dummy treated with duck scent. 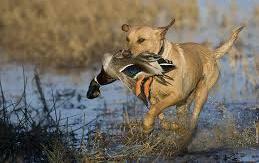 Hold the pipe out from your body, and drag the wing or dummy along a scent trail through yard. The pipe prevents your own foot scent from contaminating the trail.